Having last visited Madrid deep in throws of a particularly brisk winter, it was a treat to return to the city and catch the last few days of the summer heatwave. A pause from the every day, my short stay in the capital city presented itself to me as a much-needed moment for respite, an opportunity to recharge. Unbeknownst to me that a retreat to sunnier climes would have me feeling my most creative and inspired in a long time. I soon discovered that best way to explore the vibrant barrios of Madrid was on foot, traipsing around the tourist hotspots and lesser known backstreets, with afternoons spent ducking in and out of boutique stores and bespoke bakeries, like Celiciouso, purveyors of gluten-free goods, or poolside, lounging around on the rooftop terraces of hotel Óscar. A city of great contrasts, rich in culture, heritage, and bite-size cuisine, it can often be overlooked, as tourists and travelers opt to immerse themselves in the hustle and bustle of Barcelona. 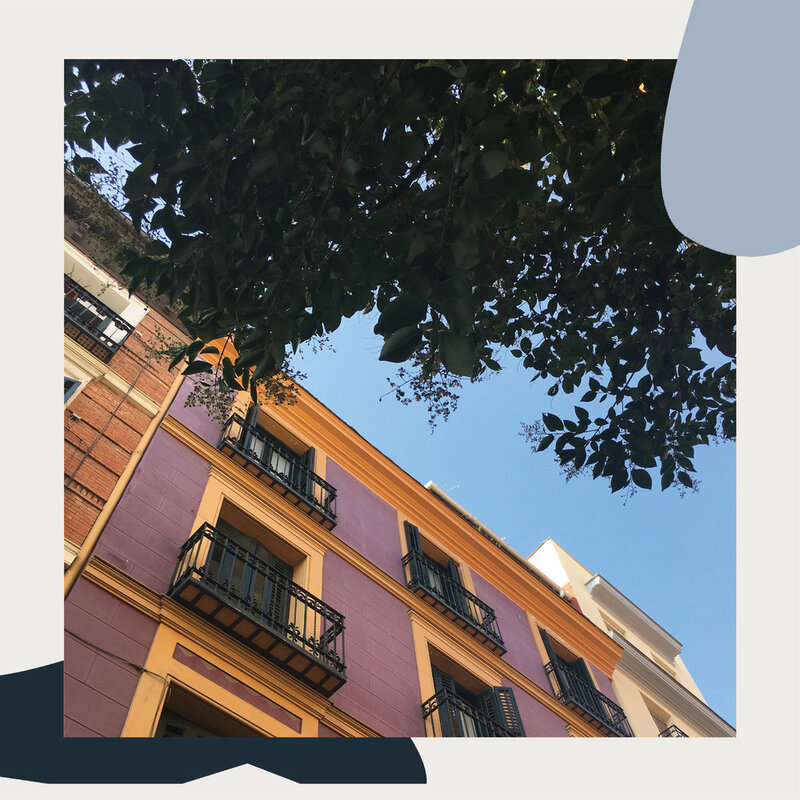 But, as we embrace the slowdown here at Yolklore, I’m going to make the case for Madrid, not merely for its chilled out vibes and unassuming allure, but as a place where, if you scratch beneath the surface, you’ll find a lot more than you bargained for. For the morning larks, the best time to see the city is as the sun slowly awakes from its slumber. 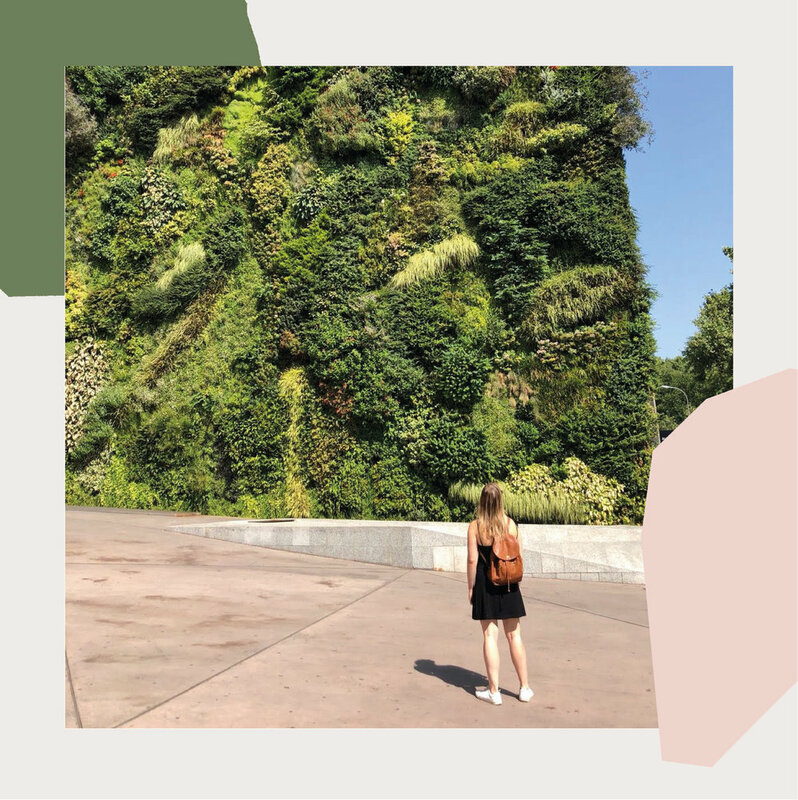 My first morning jaunt led me to the CaixaForum and the adjacent vertical garden, a lush oasis of flourishing flora and fauna and home to over 250 species of plant. Designed by Patrick Blanc and located just stone's throw away from the Prado museum in the cultural quarter of the city, the living garden offers both beauty and relief in the heart of the city. A quick nosy around the corner landed me upon La Fabrica, a multidisciplinary concept space, offering a great display of books, photography and alternative gifts, a present for you and your loved ones. For mid-morning pick me up I headed to Calle de Attocha for a grab and go caffeine fix from Luso Coffee, a hole in the wall concept offering delicious pastel de natas and service with a smile. By late morning I found myself in the Cortes district, a hub of artistic and creative activity, the pavements beneath etched with the words of residents and poets. Window shopping an experience in its own right, with store fronts as beautiful as the contents of the shop itself; I found myself falling more in love with the city as the hours passed by. Navigation skills admittedly not always my forte, I somehow managed to stumble upon the Latina quarter (in the opposite direction) and by chance stumbled upon one of my best finds of the trip, El Imparcial, a restaurant and lifestyle shop collided. A magazine lovers dream, shelves packed full of the latest titles from the indie publishing scene; a treat for the writer within, but perhaps not as good for the bank balance. Eat like the Spanish do. A city of undisputed gastronomic pedigree, our trip was punctuated by a number of midday excursions to our local food market, Mercado San Miguel. The formidable ironwork structure dating back at least a century, houses some of the best food in Madrid. From mozzarella stalls, to purveyors of delectable squid sandwiches, in beautiful and atmospheric surroundings mapped out by counter bars and banquet-style tables, you can easily spend the afternoon here, putting the world to rights and washing down the pintxos, jamon and cheese, with a glass of Asturian cider or crisp glass of rose. 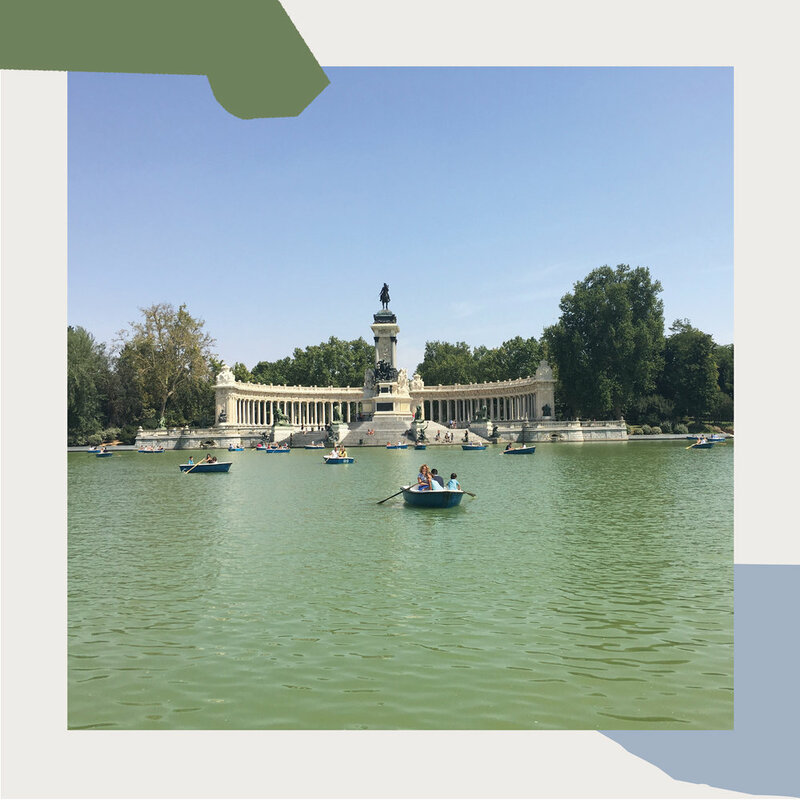 For a change of scenery we ventured to the rather picturesque surroundings of Retiro Park, a space for quiet contemplation, rowing boats on the lake and exploring the beautiful Palacio de Cristal, an architectural masterpiece hidden away amongst the trees. To escape the hotter days we retreated to Hotel Oscar for its rooftop pool and stunning views of the city below. The perfect spot for R&R, drinks poolside and more tapas, the ultimate way to watch the sun go down before the city comes to life at night. Before heading out into the night, we grabbed an aperitif or two from Mercado de Anton Martin’s Bun & Bones, the Asian fusion street food bar, perching ourselves street side, engaging in the fine art that is people watching. A few stops on the metro to Tribunal deep in the Malasaña barrio, with a strong avant-garde feel, the neighborhood was brimming with bars and restaurants as far as they eye could see, as people spilled out onto the streets enjoying the lingering warmth of the summer evening, a buzz and atmosphere like no other. Wanting to feel the sand between our toes we headed to Ojala, where beach vibes and contemporary dining meet. Upstairs hanging baskets swept across the pastel coloured walls, as we nibbled on Iberian ham, arugula, quinoa tabouli and rustic bread, later descending to the beach below, where white sands, tiki bar stalls and mellow beats transported us away from the metropolis that is Madrid. Top tip: the bathrooms alone are worth a visit, trust me. Feeling nostalgic we moved on to Lolina, a vintage cafe, sipped on espresso martinis and clashed with the 1960s inspired interiors and groovy furnishings. The night ended, or started, depending on your take on salsa dancing at Azucar bar, a truly cultural experience, where my supposed dance floor knowledge, drawn only from watching Strictly Come Dancing, became wholly inadequate. As couples chopped and changed with every dance, we were put through our paces before retiring to sidelines to watch in awe as locals danced the night away to Salsa Cubana. An experience very much away from the every day. Madrid, a place for the culture seekers, the culinary connoisseurs, and the wanders within us all. Come rain or shine, the city is a treasure trove of experiences, from exploring the barrios, to hitting up the hugely popular art galleries and museums, or sitting among the trees in Retiro and viewing the golden skyline from the rooftops above, Madrid will leave you inspired, rejuvenated and itching to come back.